A few kilometres south of Reykjahlid at Lake Mývatn is one of the most unique and fascinating landscapes in Iceland. 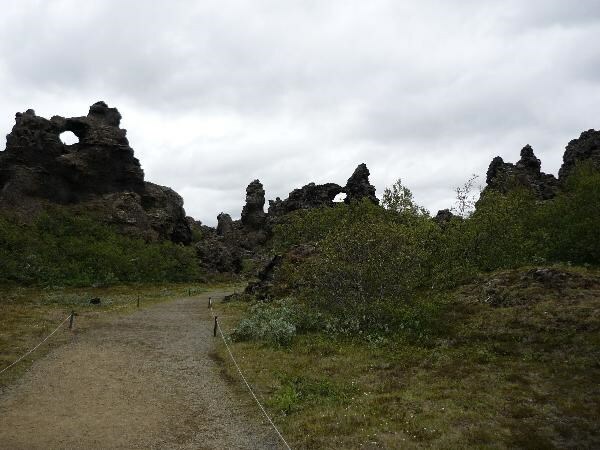 Dimmuborgir is a large area of unusually shaped lava fields. It is composed of various caves and rock formations, remnants of volcanic activity that are perhaps reminiscent of an anciently collapsed citadel, with columns spewing plumes of sulphuric smoke. In Icelandic folklore Dimmuborgir are said to connect earth with the infernal regions and is the purported dwelling-place of elves and trolls. 1. Lava spills over a water-filled depression or marshland, forming a lava lake. The surface layer solidifies quickly and the underlying layers immediately. 2. The magma heats the water in the sub-surface layer, creating steam at the water’s surface below the lava. The steam bursts up through vents while the surrounding magma solidifies. 3. The lake breaches its dam, causing molten lava to flow between the steam vents and out into a lava channel. The surface crust subsides. 4. Standing left are the columns and ridges, the remains of the steam vents, etc. Between them are dykes and gaps, where the lava flowed. 1.) What is the meaning of the word Dimmuborgir? 2.) How many years ago originated the rock formations? 3.) How is the place called at the cache coordinates? 4.) By which colours are the walking paths denoted at the Dimmuborgir area? Logs without E-Mail answers will be deleted. It would be very kind of you to upload a photo that shows you with your GPS at the cache coordinates. We hope you enjoy this EarthCache! Lryybj vf n ernyyl avpr pbybhe.